Hello my dears. I know I missed Monday's post and there wasn't a post today. I am going to take a couple days off from blogging and will hopefully see you next week. We got back from Austin late Monday night and I am pretty tired with all the craft shows we've been doing.. Definitely feeling a little blog burnout. This quote by David Allen has really got me thinking. I have so many ideas and things I want to do - sometimes feel like I can just take over the world. I think I may just have a slight problem on focusing (okay, it's a big problem) and I am finding a lot of my work suffers because I spread myself so thin. I want to do so many things that it keeps me from actually accomplishing things in my life and being productive. 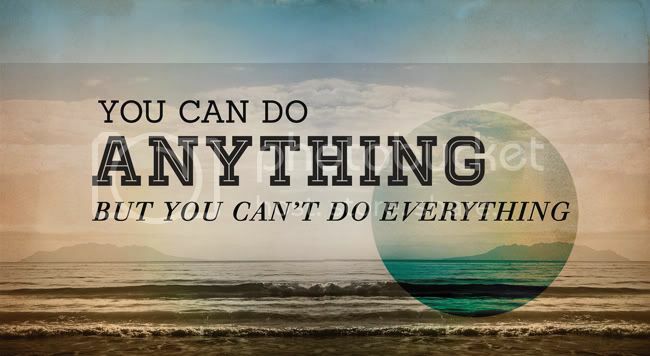 You can do anything, but not everything. Now if I can only remember this from day to day. Enjoy the rest from a little break! I hope to see you back around here soon, once you've recovered and perhaps caught up a bit! Wanting to do all sorts of things has been my greatest battle for the past year! As stay at home mom with two kiddos under the age of 2,getting house in order, learn graphics design and working a business to aid our income. God knows whats important. I've never been in such peace as I am when I pray this prayer. Pray for clarity in first the Lord,then family, household, business, and everything else. And your desires and actions will fall into place. :) Enjoy this week. God Bless! Knowing what an awesome person you are, I bet you have a crazy amount of projects on your plate, in your head, and in your heart, hence being overwhelmed. Creative spirits such as yourself sometimes need a break- it's good for our souls. I like this post :) have a great blogging break, rest up! i definitely resonate with this and it's made me feel rather defeated lately. love the blog too, girl. keep it up. It happens to me all the time, there´s so many things I want to do that my brain end up as a big mess. I normally take a day or two of nothing... listening to music, reading some book, be away of all your projects. It´s a way to calm down your brain. The third day you´ll feel fresh and you will organized all the things you want to do and start doing them in order. thanks for sharing and being honest Danni. yes i suffer it too - one of the trade offs for being a creative i guess - and one that can get us down. so enjoy your break and good for you - i hope you feel the blessing of saying 'no' to this for a time. Oh you've absolutely hit the nail on the head with these quotes. Yes, I feel overwhelmed most of the time! I need to remember that I can't do everything all at once. I think it's the curse of people with ambition and ideas - we want it so badly we need to learn to slow it down a bit. Thanks for this post and for the reminder. I sincerely hope you have a wonderful break! I was wondering if the winners have been announced yet for your giveaways? Sometimes, a little (or long) break is just what you need to get your focus back. When you step aside and watch things happen for a while, then you realize what actually is more important for you! Yeah ,sometime its become every important to have a little break from everything to refresh mind and you get sometime for yourself where you can do what you want to do. Many years ago I had an enlightened moment where I realized that despite what the world at large tells us...we just can not do it ALL - at once. We can do a lot...or maybe even close to all of it, but just not all at the same time...and we should not feel badly about this. So as we do these things that we do..we need to remember... to give ourselves credit for what we accomplish and to keep in mind that while today we are cleaning house and taking care of a little one - tomorrow we can take care of the little one and paint a picture or plant in the garden...and the next day we can clean and take care of the little one and go to the park...or make a gift for someone....We don't need to do it all at once - we can spread it out a bit....some days the laundry won't get done, but we will create something wonderful...some days we will make the best dinner ever while we dream of the next fantastic project that we want to do with our children...and that project will probably get done on a day when dinner is a PBJ sandwich. This is the cutest site I have ever seen! I absolutely love the design! you take a little rest girl! i sometimes feel overwhelmed like you too and i do feel that unplugging helps!!! enjoy your time off! Bravo Danni! Knowing when to say when is important. OH...and congrats on the new home!!! I love the saying, that if you say "yes" to one thing you are saying "no" to something or someone else. It helps me focus on what I really want to say yes to. Because for instance, if I am so tired but really want to go to this party and I say yes, I am saying no to myself and possibly the whole next day, because getting proper rest would be a good thing to say yes to. Does that make sense? Your post made complete sense to me, so hopefully my comment does too. I pinned your top pic :) because those words are so very true. Anyway we could get a print of that first image - I love it so much and would love to have it on my desk to look at everyday! I'm a "yes" girl and find it hard to say no even when I know I can't.